Why our services are much more than just "putting in a kit"
Here's an overview of what we offer for each section of the Quadrajet and complete build. Each of these will be discussed below and what services are done to each. The base plate is disassembled by removing the primary and secondary shafts. Primary shafts become loose in the original aluminum base from the age and wear, so bronze bushings are used to prevent vacuum leaks. The shafts are reinstalled with the throttle blades and set up to open to 90 degrees to assure best performance. The circuits may also be modified in the base plate for air/idle mixture and air bypass for larger cam, higher compression engines. Base plate is ultrasonic cleaned, blasted and resurfaced on bottom to assure good seal to intake. The air horn is the top section of the Quadrajet has many components to work with. 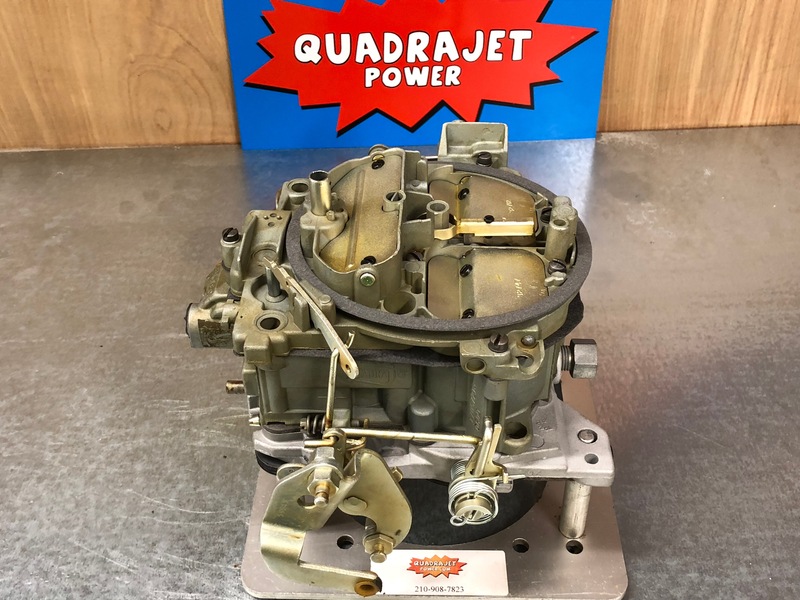 Like the base plate, a common auto store kit doesn't have any parts for this, but it sure needs attention for the Quadrajet to perform for you. The air horn is removed as well as the primary choke & the secondary air valves. The shafts are also removed and the secondary air valve cam is removed & will be replaced. Many of these are broken or significantly worn after 40 years of service. We replace the cam and the tension spring on every build. The vent tubes are all removed and cleaned, and also checked for blockage before re-installation. Most air horns are warped from over-tightening, so we resurface to make sure it has a good seal to the main body. Many applications don't require a choke so the front choke flap can be removed. The secondary air valves may also be modified to assure a smooth transition when they open. This is where a lot of work goes to make the Quadrajet its best. And there are a few parts in the auto store kit for the main body, but it still falls way short of what is necessary. The main body is disassembled completely to begin, and is soaked then takes its turn in the ultrasonic cleaner. All of the passages are measured and modified if needed to match the engine and driving situation for the carb. The Quadrajet just won't idle when placed on a high compression big cam engine without these modifications. After the sections are built, it all goes back together. Carefully making sure every component is working like it should. The Quadrajet is then shrink wrapped and placed in a double wall heavy duty box and packed in with material. Adjustment instructions are included and it is shipped out with insured shipping for your protection. What level build do you need? Level 1 Build: Level 1 is for a stock engine with the correct Quadrajet for the year, make, model and cubic inch engine. The Quadrajet will receive many enhancements to correct known issues. Such as epoxy sealed fuel wells. Jets and primary rods will be chosen to calibrate for today’s ethanol added fuels, which burn faster than the original fuel the Quadrajet was designed for. Level 2 Build: Any engine that has been modified with a mild cam, headers, aluminum intake, or the Quadrajet wasn’t originally make for this stock engine would need at least the level 2 build. This level also good for a stock engine that a customer is looking for great driving characteristics, but wants that great performance when the pedal is pressed to the floor. This Quadrajet will provide a good idle and smooth transition all through the power band. This level also good for the driver looking for serious performance. Engines with modifications including higher lift camshaft, higher compression, head porting and other performance modifications will benefit from the level 2 build. Engine will idle correctly on the idle circuits, and have smooth transition all through the power band. Secondaries will open quickly and fully to give that engine the flow it is looking for to deliver the power it was built for. Level 3 Build: Built for maximum performance. This quadrajet will utilize our tips and tricks to get the most when you need it. Still has good street manners, in fact, much better street manners than any aftermarket performance carburetor. But this Quadrajet will bring you the maximum power you are looking for. Color restoration is a process we have learned after many years of testing with chemicals and liquids that are available today that are safe for us to use and the environment. The main body and air horn are cleaned and stripped before going through a multi stage dipping process to add back color to the original castings. We also offer zinc chromate plating for body and air horn if desired. The external hard parts are zinc plated and dipped in chromate solution for the gold or silver appearance. These carburetors and parts are up to 50 years old now and many have been through a very hard life. We do everything we can to bring out a nice finish, but each carburetor is unique and will finish differently than others. We do everything we can to deliver a great running, and great looking Quadrajet!